There are a lot of unknowns attached to this cabinet card portrait of a lovely woman in a dark dress with puffy sleeves. Who is the photographer? Where was the photograph taken? Who is the subject? The answers to these questions have been lost to history. The woman projects a strong appearance and has pretty eyes. The gentleman in this cabinet card portrait looks amazingly like Abraham Lincoln (1809-1865), the 16th President of the United States. As much a I would like this to be an early photograph of Lincoln, it most certainly is not. This photograph was produced several years after Lincoln’s death. The photographer of this image was George Pine (1840-1906). For part of George’s photography career he operated a studio with his brother Robert G. Pine. Records indicate that Pine conducted his business at the 27 & 29 East State between 1878 and 1888. He operated out of several addresses over the course of his career and all of his galleries were located in Trenton, New Jersey. I was able to confirm that he ran the studios from at least 1872 through the early 1900’s. George was born in New Jersey. An 1867 business directory indicates that he and his brother had a gold and silver plating business before entering the field of photography. The 1880 US census reveals that George lived in Trenton with his wife Theodosia Burroughs Pine (1842-1900). The couple were living alone. The Trenton Evening Times (1906) ran George’s obituary. He died in Trenton although he did spend some years in Florida where his wife passed away. At the time of his death he was the curator of the Cadwalader Park Museum. 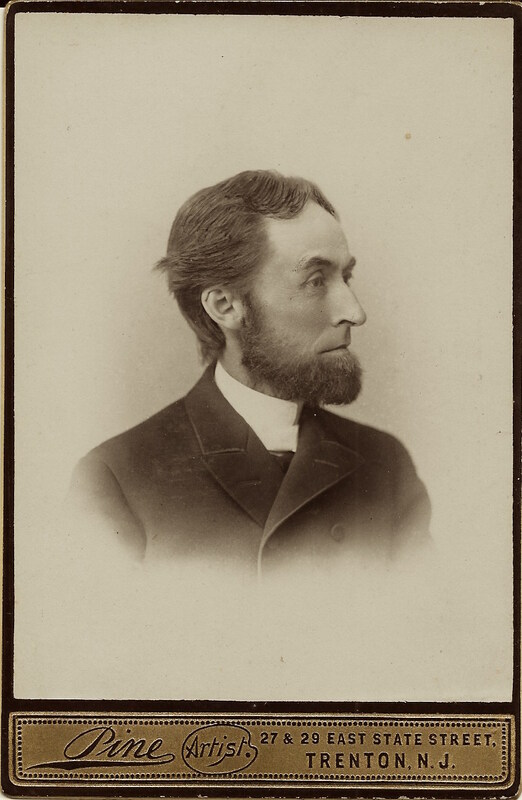 The article states that after a successful photography career, George had become a “prominent naturalist”. Cadwalader Park is located in Trenton.The park is nearly 100 acres and is the city’s oldest park (construction began in 1887). The park was designed by Frederick Law Olmsted (creator of New York City’s Central Park). A cute little girl wearing a checkered dress and big hat posses for her photograph at the Lawrence studio in Worcester, Massachusetts. The child projects an air of confidence as she gazes at Frank Lawrence, the photographer. A drawing of Lawrence’s studio can be seen on the reverse of this cabinet card (see image below). His studio was located on the John G.Clark’s Block. To learn more about this photographer and to view more of his photographs, click on the category “Photographer: Lawrence”. 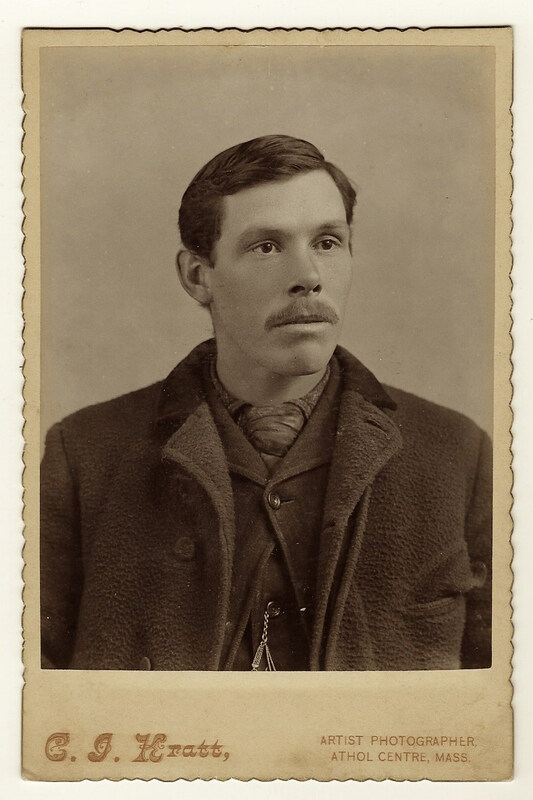 The cabinet card gallery has over a dozen photographs by photographer John D. Strunk. This image joins two other fireman portraits by the prolific Mr. Strunk. 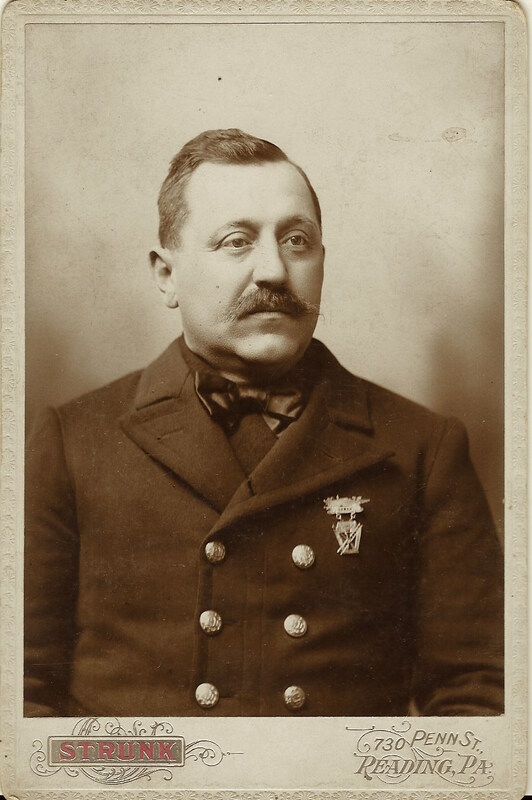 This cabinet card features a fireman wearing his dress uniform. Note his brass butons and his badge. To view other photographs by this photographer and to learn more about him, click on the category “Photographer: Strunk”. 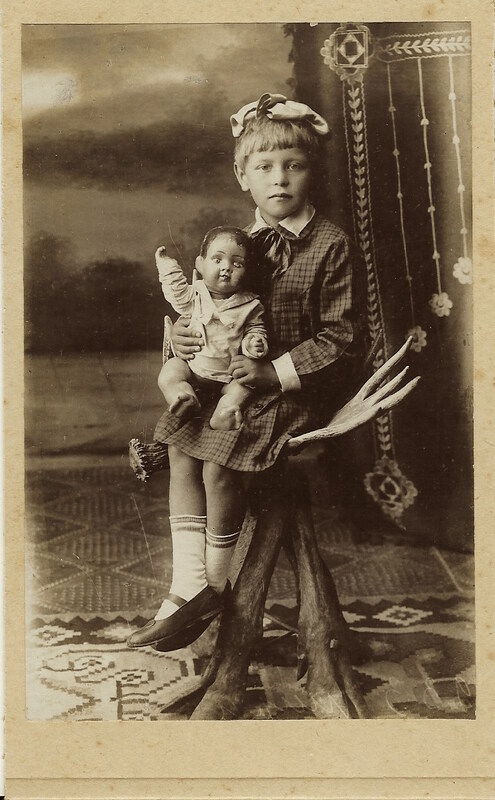 This vintage photograph features a cute little girl holding a not-so-cute doll in her lap. The doll has a very life-like appearance. The child is sitting on an unusual carved wooden chair. She is wearing a checkered skirt and a hair bow. The photograph was purchased from a Russian collector and likely originates there. The photograph is on card stock that is slightly thinner than the paper board seen on most cabinet cards. A young man, probably a teenager, poses for his portrait at the Keller studio in Nappanee, Indiana. The young gentleman is well dressed and well coiffed. Either he, or someone else, spent a good deal of time and work to properly arrange his hair. 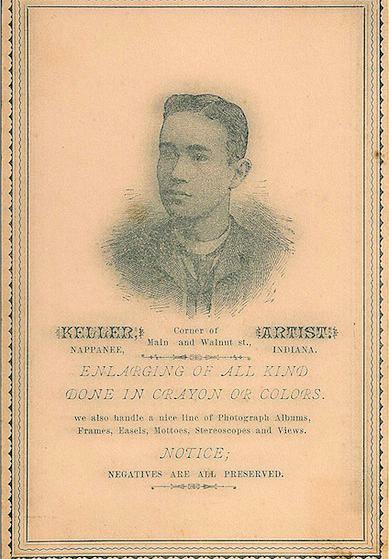 John M. Keller (1867-1943) opened his photography studio in Nappanee in 1897. An ad in the St. Louis and Canadian Photographer (1900) advertised the business as being for sale. The 1900 US census listed him as working as a bicycle dealer. 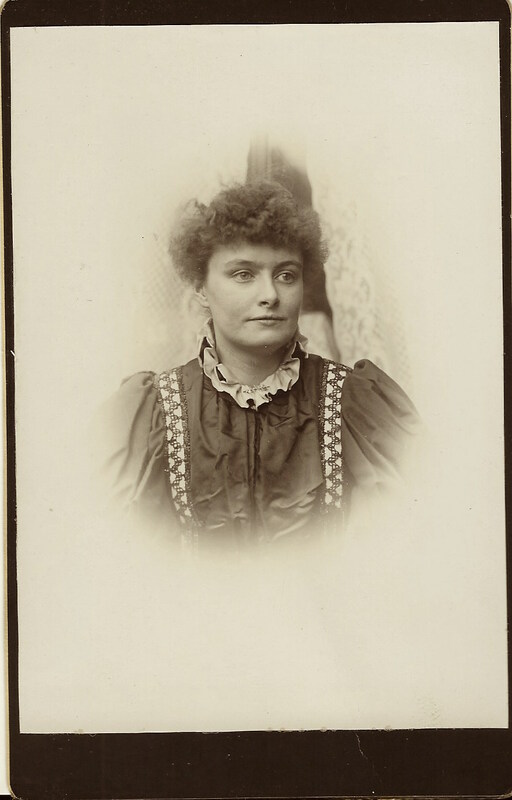 Keller married Clara Burbach in 1891. The 1908 Elkhart (Indiana) business directory reported that he had a store selling bicycles and sundries, as well as repairing sporting goods. By the time of the 1910 US census, Keller had a new occupation. He was working as a garage manager. The Goshen Democrat Newspaper (1912) reported that while Keller was testing an automobile, the flywheel came off and struck him below the knee. The unfortunate accident broke his leg. Interestingly, the newspaper also stated that after injuring Keller, the flywheel continued it’s journey and actually went through the side of the building. The 1920 US census found Keller working as a “garage mechanic” in Frankfort City, Indiana while the 1930 US census lists him as unemployed and living in Rochester, Indiana. It turns out that Keller was a real entrepreneur. According to the Rochester Historical Society, In 1921 Keller built and operated the Keller Inn which was located near the edge of Lake Manitou. He also made lures for fishermen. Apparently Keller had a shady side. During prohibition he made and sold liquor and “locals reported he also ran prostitutes out to an island in Lake Manitou”. Keller died at age 75 from heart disease. Much of the information about J. M.Keller was found at an internet site (http://www.folkartfishingtackle.com/#!john-keller/cadr). The image below was also found there. The image is a back stamp from one of Keller’s cabinet cards. 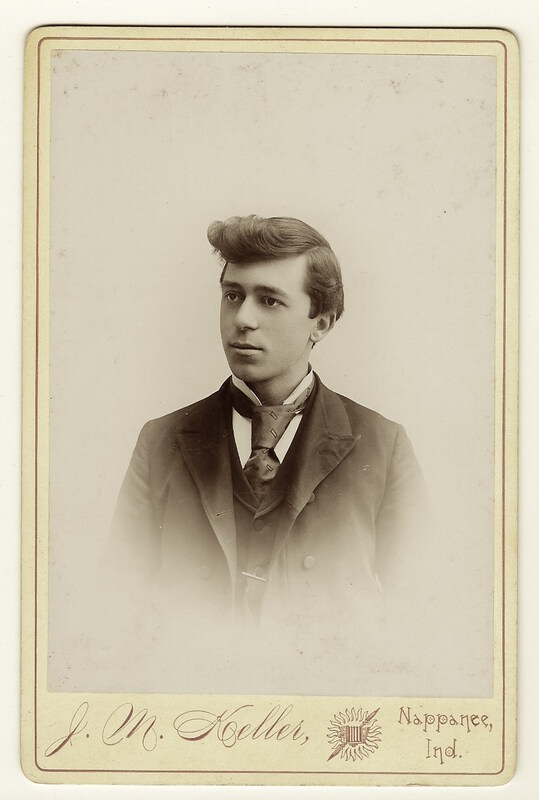 It seems likely that the young man pictured in the image is Keller himself. I can’t resist supplying an interesting fact about the town of Nappanee. It is the longest city name in the US which has each letter in it’s name appearing twice. This carefully posed vintage real photo postcard begs the viewer to hypothesize about what’s happening in this photograph. 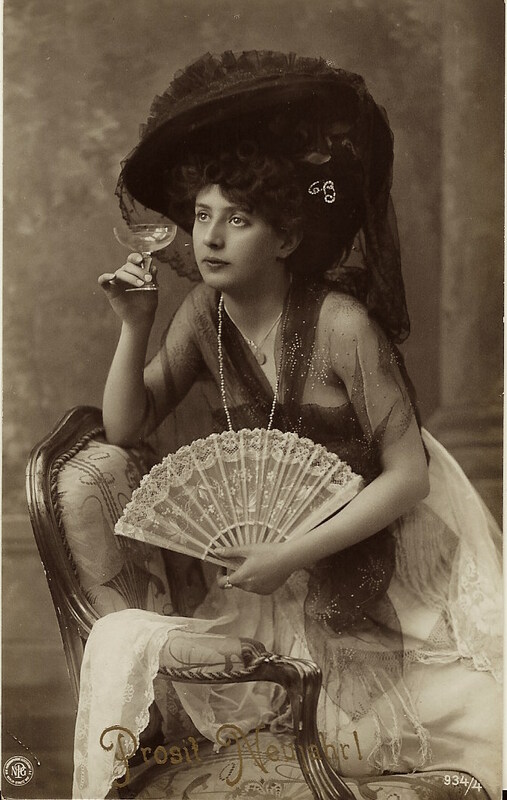 A pretty young woman displaying a far-away look holds an open fan in one hand and a glass of champagne in the other. Her dress and appearance could be described as risque. The top part of her dress is sheer and beaded in places. She has a beautiful hat and wearing a fancy hair ornament. The woman is well dressed and stylish. What is this lovely lady thinking about? Any guesses? The preprinted message on the bottom of the postcard, “prosit neujahr” is German for “Happy New Year”. This postcard was published by Neue Photographische Gesellschaft (NPG) in Berlin, Germany. The postcard was part of a series and was mass produced for sale. It was likely published in the 1910’s. 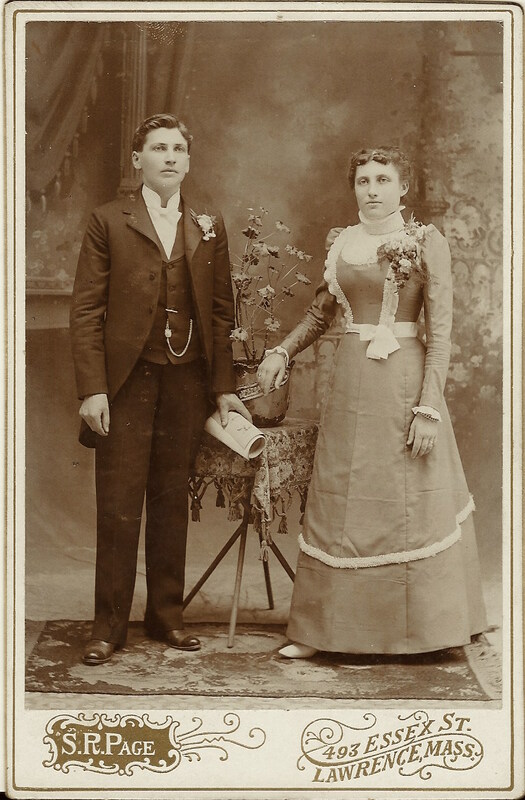 Sometimes the cabinet card gallery features vintage photographs that are not cabinet cards. Some may find fault with the site’s occasional lapses of fidelity to the cabinet card era. However, I can not stop myself from sharing other types of vintage photographs in my collection. This real photo postcard is truly special. 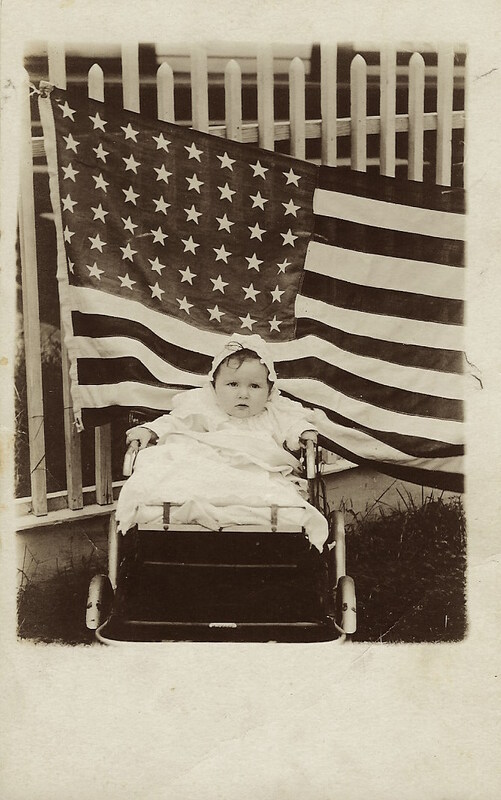 A cute baby sits in a carriage in front of a 48 starred American flag. Behind the child is a white picket fence. The only items missing from this patriotic photograph is a Chevrolet and an apple pie. The postcard was produced by AZO between 1918 and 1930. 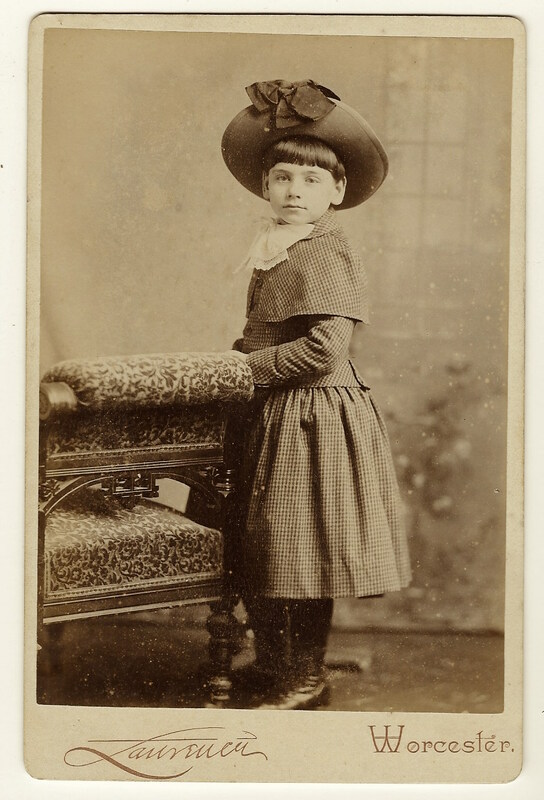 If you have an opinion as to whether I should be including vintage non cabinet card photographs in the Cabinet Card Gallery, please let me know by leaving me a comment. A bright eyed and handsome young man poses for his portrait in the stduio of C. J. Kratt in Athol, Massachusetts. He has neatly combed hair. Besides his mustache, he is very clean shaven. He could pass for a Gillette razor model. The gentleman is dressed for winter. Note his pocket watch chain. The reverse of the photograph has two inscribed names (see below). The top name is crossed out but looks like “J. Whitney”. 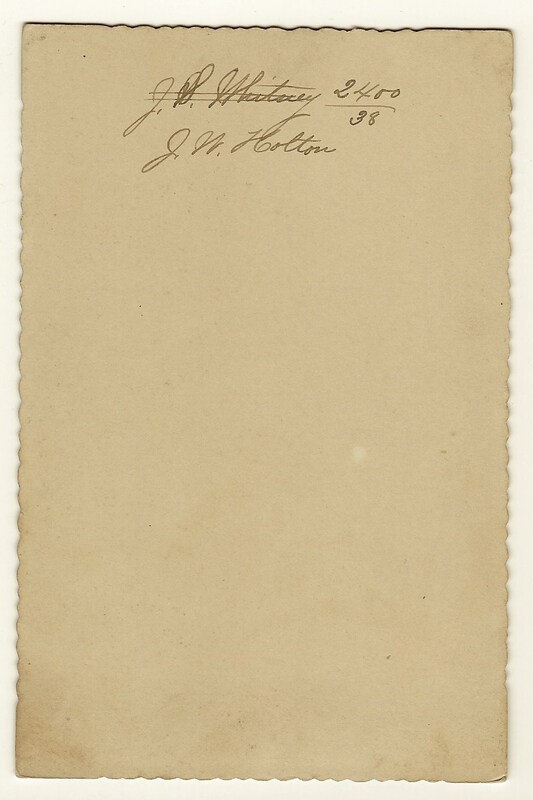 The second name appears to be J. W. Holton.